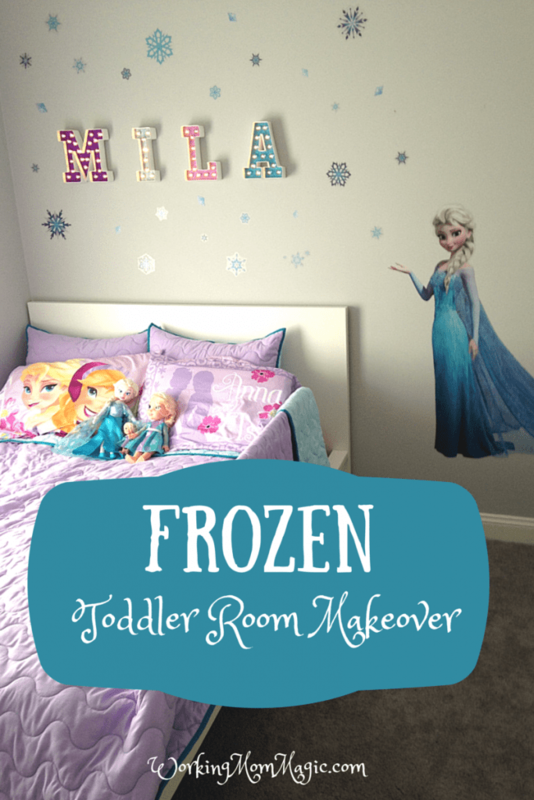 My sweet girl recently got a FROZEN room makeover and I just wanted to share it with you guys! As we all know, she is Frozen obsessed and I thought adding a bit of Frozen magic would help FREEZE her to her bed at night. Well, she still wanders over to my neck of the woods almost every night, so it did NOT work, but at least her room looks super cute. Mila’s big moment, and ironically enough she FROZE! Mila started jumping out of her crib super young, like 18 months.. so she has been sleeping on a mattress on the floor for a while. So we finally got her a big girl bed from Ikea, I took down her nursery decorations and decided on a Elsa makeover. With Hudson I got him a plain comforter and just change out his sheets with whatever he is into at the time. It works out well and saves me a ton of money. Kids change what they like often and I don’t want to have to makeover their room every time. I love wall decals for the same reason. When they decide they are over whatever is they were into… then I just pull off the decals and get something new. I got Mila a plain reversible comforter at Target. It is light purple on one side and teal on the other. She loves purple so I really wanted to incorporate it. It also goes with the Frozen sheet set I got. I love the look of marquee light up letters, I have been seeing them all over Pinterest. So I decided to get the Marquee Love letter kit they have at Michaels when I spotted them for 50% off a few weeks back. I had a 20% off your entire purchase coupon to stack on top of that, so I ended up getting each letter for $4.19. (woot! woot!) I bought glitter scrapbook paper in different shades of purple and teal since I wanted to customize the background of the letters that way. Maybe if you use thinner scrapbook paper the holes just kind of rip to fit the bulbs, but my glitter paper was no joke so that wasn’t happening. So here’s what I did… and it worked awesome! I just grabbed a pencil and jammed it through to make the hole larger. (I soon moved up to a pen that was a bit wider… but at this point I was so irritated by the letters that I stopped taking pictures) Once I figured that out, the rest really was very easy. The lighted letters look SO cute on the wall… it is worth the 14 extra grey hairs I now have on my head. She loves her Elsa room! March Family Favorites Family Favorites: Disney Edition! Family Favorites: September Bye-Bye Paci’s! Love it! Especially the name marquee. Too cute. Love the look and love the letters! She's a lucky girl and you're a very nice mama for putting that together! Great job! Wow, I really like the Marquee letters. My daughter would love that. Great job. I thought they were so cute.. and I can always just take out the glitter paper and replace it with something different! Totally adorable room and I really like the name Mila! Nice job momma! Adorable! And the room can really grow up with her. When she is 13 she may still love seeing her name in lights. Based on the drama she brings to the table at only two years old.. I am SURE she will! HA! if it wasn't because my baby girl is now 17 getting ready to go off to college, I probably would have had to decorate her room (again) just like this. My daughter has had her room painted and decorated, I believe, 6 times. Under the sea – Ariel. Dora – not my best. Ocean scene – that was work. and I can't remember the first few times. Currently it is a music room since she in in band. I love the idea – great job. I have ZERO art skills, so if I tried to paint her wall that would be a disaster! But how special that you painted it! Mila is just adorable! My nieces are also obsessed, I feel ya. I love that you did the letters on your own—and they look of professional quality! The pictures of your daughter with Elsa are priceless. Elsa also visited us on my niece's 4th birthday and she just may never stop talking about it—such sweet memories! I hope your baby girl continues to love her room and her mama for designing it! I know. I am loving this time with her… I let her princess it up since I know it is short-lived! 😉 Have a great week! The letters are SO adorable! Nice job!! You did a fabulous job Lauren!! I saw those letters at a craft store before.. Didn't think to add a background to them. Maybe something to do soon. Mila is adorable!! How adorable! I bet she loves her room. Great job! That is a great idea to do print outs!! I never thought of that! yeah. she is already dabbling with the little mermaid so I have a feeling the teal/purple comforter was a good bet! ha! The room is absolutely adorable. I'm in the middle of a toddler room makeover myself. I saw the Marquee letters a while back at Michael's now I wish I got them. Oh my goodness, mom of the year goes to you! This is adorable!!! Funny thing is, I bet my boys would be in heaven haha ? Hahaha! My son loves her lightup letters!! Cute! My girls were Frozen OBSESSED back when the movie first came out and there was like no Frozen merchandise to be found. Now, that we are all swimming in our necks with Frozen paraphernalia- they're over it naturally 😉 But, man, had they seen these pictures of Mila's room a year ago- I wouldn't have heard the end of it! 🙂 Too cute. That is how it was with my son and Star Wars Angry Birds!! I had to basically make up his birthday decorations since there was nothing out there.. now it is EVERYWHERE and he is like.. bleh.. whatever. ha! Wow! This is awesome! My girls would go crazy over this. I love the letters – so clever! I love this! It turned out so great! I especially love the name-it looks so awesome! My daughter would love it too! yeah there is also glitter in the snowflakes but you cant see it in the pics. I am obsessed with the name too! This is a cool DIY. My nieces are crazy about Frozen. I'm going to steal some of your ideals. Wow! How lovely! A little girl's magical place. 🙂 So pretty! Yes now I just need to buy her more "elsa" pajamas since she wears the same one every. single. night. What a beautiful makeover! Your little girl is so lucky and probably the envy of her friends! oh my gosh look at the comments – the power of FROZEN! i like your letters! Love it. And the letters look great, unique, I must say. My daughter loves Frozen stuff too. I think its time I should redo her room too. Wow, I especially love how you did the letters! You have one lucky little lady!! Thanks for linking up at #MeetUpMonday with thequinntessentialmommy.com (and me, but I missed hosting this week)! Too cute! What color is the wall?